U.S. stocks veered sharply lower in afternoon trading Tuesday, pulling the Dow Jones Industrial Average down 700 points. 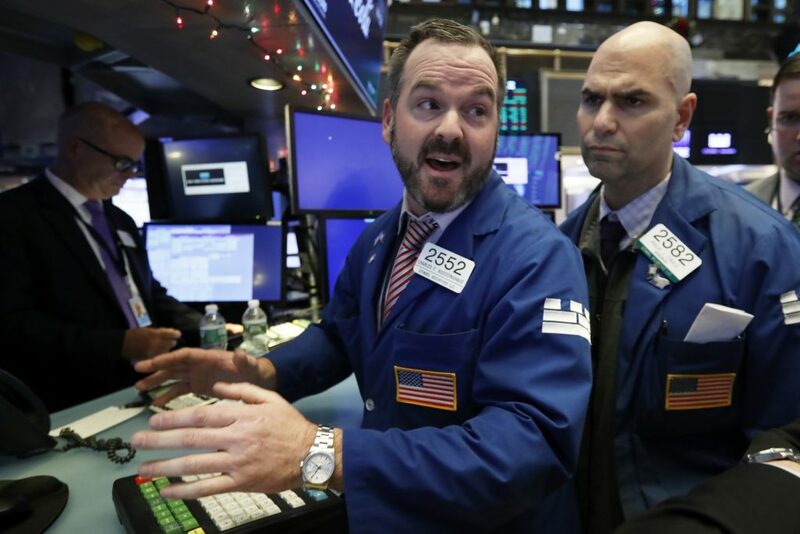 The wave of selling erased the market’s gains from a day earlier, when stocks rallied on news that the U.S. and China had agreed to a temporary truce in their trade dispute. Investors’ confidence in that truce appeared to falter Tuesday, contributing to renewed fears about a slowing global economy. Technology companies, banks and industrial stocks accounted for much of the sell-off as traders moved assets into the relative safety of U.S. government bonds, driving yields sharply lower. Utilities stocks rose. Smaller-company stocks fell more than the rest of the market. The S&P 500 index slid 79 points, or 2.9 percent, to 2,710 as of 1:29 p.m. Eastern Time. The Dow plunged 730 points, or 2.8 percent, to 25,095, more than erasing its 488-point gain over the previous two trading days. The Nasdaq composite lost 240 points, or 3.2 percent, to 7,201. The Russell 2000 index of smaller-company stocks gave up 51 points, or 3.3 percent, to 1,497. The index now has a loss for the year. The sell-off came ahead of Wednesday’s closure of U.S. stock and bond markets in observance of a national day of mourning for former President George H.W. Bush. The sharp turn in the markets followed a strong rally on Monday fueled by optimism over the news that President Donald Trump and his Chinese counterpart Xi Jinping had agreed at the G-20 summit over the weekend to a temporary 90-day stand-down in the two nations’ escalating trade dispute. But the market’s optimism faded Tuesday amid published reports questioning the scant details out of the Trump-Xi talks and growing skepticism that Beijing will yield to U.S. demands anytime soon. The trade dispute has rattled markets in recent months as signs emerged that it has begun affecting corporate profits. That’s stoked traders’ fears that if it drags much longer it could further weigh on global economic growth. The jitters helped drive demand for government bonds Tuesday, pushing prices higher. The yield on the 10-year Treasury note fell to 2.91 percent from 2.99 percent late Monday, a large move. The slide in bond yields, which affect interest rates on mortgages and other consumer loans, weighed on bank stocks. Citigroup fell 5.4 percent to $61.63. Chipmakers were among the biggest decliners in a technology sector slide. Advanced Micro Devices dropped 9.4 percent to $21.49, while Micron Technology lost 6.4 percent to $37.47. Homebuilders fell after luxury homebuilder Toll Brothers issued a cautious assessment of the housing market. Toll’s shares rose 0.4 percent to $33.67, recovering from a morning sell-off. Hovnanian Enterprises led most builders lower, giving up 10.3 percent to $1.10. Apple lost 3.7 percent to $177.99 after the consumer electronics giant was downgraded by HSBC analysts, citing the possibility that iPhone volume and value growth may moderate due to a saturated mobile phone market. Discount retail chain Dollar General slid 8.2 percent to $102.54 after the company reported weak quarterly results. AutoZone climbed 5.6 percent to $870.65 after the auto parts retailer delivered third-quarter earnings that exceeded analysts’ forecasts. Oil prices headed higher ahead of an OPEC meeting on Thursday, where members are expected to agree to cut output in 2019. Benchmark U.S. crude rose 0.6 percent to $53.27 per barrel in New York. Brent crude, the international standard, added 0.9 percent to $62.22 per barrel in London. The dollar weakened to 113 yen from 113.69 yen late Monday. The euro strengthened to $1.1349 from $1.1342. The British pound fell to $1.2727 from $1.2728 after a top official at the European Union’s highest court advised that Britain can unilaterally change its mind about leaving the EU as scheduled on March 29. Markets in Europe also fell. Germany’s DAX lost 1.1 percent, while France’s CAC 40 dropped 0.8 percent. The FTSE 100 index of leading British shares slid 0.6 percent. Major indexes in Asia finished mixed. Japan’s Nikkei 225 index gave up 2.4 percent and the Kospi in South Korea lost 0.8 percent. Hong Kong’s Hang Seng added 0.3 percent. The S&P ASX/200 in Australia gave up 1 percent.